Melissa updated her Instagram page with a few photos on the morning of January 30th. In this shot, we can see she’s wearing JOYRICH’s new Spring 2016 $247.00 Indigo Denim Brigade Coat with the brand’s matching $159.00 Indigo x Light Blue Denim Brigade Pants. Melissa posed in this photo uploaded on January 22nd wearing a $149.00 Zara Wool Coat in Red. The cost features oversized lapels. Unfortunately, it has sold out online. Melissa updated her account on January 17th with this photo wearing her $1,245.00 Trapstar London Chesterfield Jacket along with the brand’s $115.00 Famele Assassin Long Sleeve Shirt. She completed this look with a pair of Fall 2015 Christian Dior Ankle Boots. Rihanna’s worn the boots before as well. Check out her beautiful shoot for DIOR Magazine. Melissa updated her Instagram on Friday morning, January 15th. Here, she sported a $200.00 BAPE x PUMA Sweat Hoodie in Black Camo. You can purchase it below for that price or at Caliroots for about $218.00. As the day progressed on January 10th, Melissa posted another set of photos in a different look. 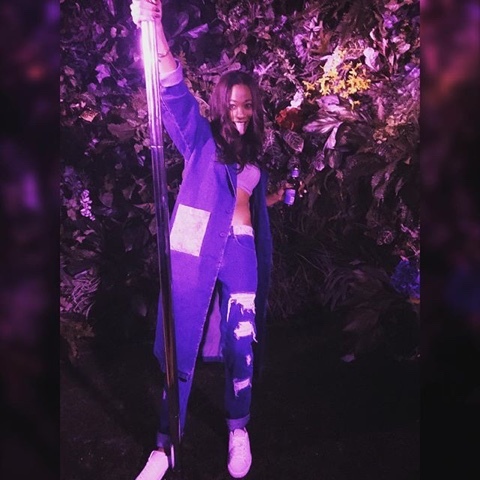 She sported a Spring 2015 JOYRICH Denim Coach Jacket in the color, Indigo. Mel debuted fhis jacket in April of last year. She coupled her jacket with Christopher Kane $1,470.00 Floral Embroidered Denim Shorts. These shorts have now sold out. Melissa was all smiles in this photo she uploaded on January 10th. Here she wore a $240.00 PUMA x BAPE Shark Hoodie. The entire collection was extremely popular and most if not all of it, has already sold out! If you really, really have to have this hoodie you can purchase it at -a higher than retail- value on eBay. Melissa posted this photo on Instagram January 7th. In this shot, she looked pretty warm wearing Trapstar London’s $1,245.00 Chesterfield Jacket. The coat has Bemberg lining, high density embroidery patches, and laser engraved metal badge. Underneath her coat she wore, a $175.00 SSDD FTW Pullover Hoodie. SSDD is the diffusion line from designer, Erik Brunetti’s label FUCT. We covered Rihanna in the brand a few times. Check it out! Shop Mel’s look below. On January 5th, Melissa posted this image onto her Instagram. Here, she suited up in a $495.00 VFILES Sport Plus Sideline Puffer. This puffer coat is orange and black and features the Sports Plus Logo on the chest with two front pockets. It’s quilted overall and has a warm, fuzzy lining inside. She then wore a Fall 2013 Rihanna for River Island $87.00 Khaki Camo Onesie. You can check out the full collection here.Of course, this piece is sold out as well as her coat. Melissa updated her Instagram account on January 4th with this still used for a video set to music. Here, she sported a $300.00 Trapstar London White Noise Rugby. The top features a contrasting pointed collar with long sleeves along with their signature Irongate logo artwork across the body with white panelling.